On September 4, 2017, the Catholic Church paid homage to an extraordinary woman whose life exemplified Christ’s call to compassion and service to others when Teresa of Calcutta (Mother Teresa) is canonized. She joined another modern apostle of mercy — St. John Paul the Great — to be canonized in recent years. It is quite rare for the Church to declare sainthood in such a short period after one’s death, but as many of us know, these two saints were rare themselves, both in their faith and their ability to discern the signs of the times. In his landmark encyclical Humanae Vitae, Pope Paul VI reminded us that the Church is a “sign of contradiction” to a society that seeks answers in technological, medical and other “advancements,” some of which oppose natural and moral law. In an age when these advancements grew at unprecedented rates, both St. John Paul the Great and the soon-to-be St. Teresa of Calcutta were clear voices for those marginalized as a result of these advancements. 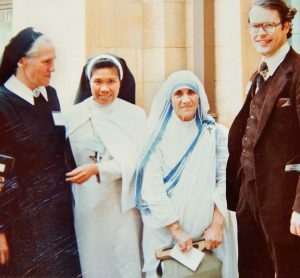 In 1978, I had the pleasure of meeting Mother Teresa. Years later, in 1993, Mother Teresa accepted our invitation to speak at the Institute’s 25th anniversary celebration of the publication of Humanae Vitae. 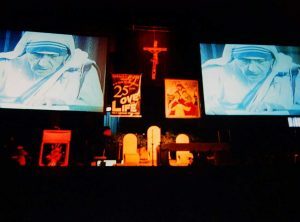 While health reasons prevented Mother Teresa from attending the celebration, she addressed the crowd by video (the entirety of which you can access at the Pope Paul VI Institute website. As was the case when Pope John Paul II was canonized, the Institute feels blessed knowing that yet again another of its strong supporters is being declared a saint. As I have shared so many times before, in our work, we meet great opposition from mainstream medicine and a culture of death that seeks to expand abortion, contraception, sterilization and in-vitro fertilization without limits. The upcoming canonization provides both encouragement and further validation for our work. Like Mother Teresa of Calcutta, the Pope Paul VI Institute seeks to serve as a sign of contradiction. To be clear, at the Institute we don’t operate to simply oppose mainstream medicine. Instead, we seek to build a culture of life, where women and families find healing within God’s design for human reproduction and sexuality. As the Pope Paul VI Institute continues to build a culture of life in women’s reproductive health care, we thank you, our supporters, for standing as a sign of contradiction with us.